MISSISSIPPI THUNDER SPEEDWAY is pleased to release details of the upcoming 2015 CHAMPIONSHIP AWARDS BANQUET, which will wrap up what was an exciting and successful 2015 season at one of the favorite dirt tracks of fans & drivers alike in the upper mid-west! 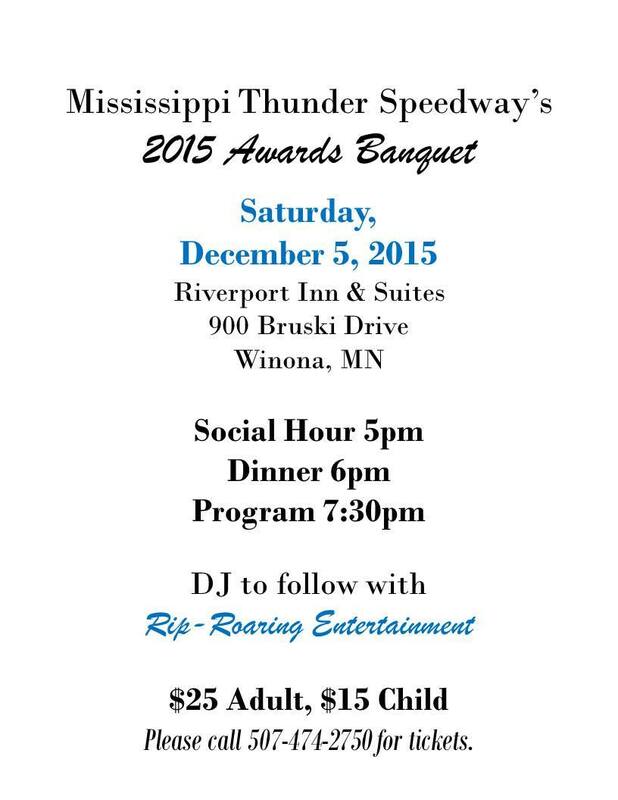 Tickets are now on sale for the 2015 MISSISSIPPI THUNDER SPEEDWAY CHAMPIONSHIP AWARDS BANQUET which will be held December 5th at Riverport Inn & Suites of Winona, MN. Tickets can be purchase at Oakridge Fabrication (located at 1140 72nd ave, Minnesota City) from 9-5 PM Monday thru Thursday or by calling 507-474-2750 if you'd like to to have your tickets available at the door. The 2015 MISSISSIPPI THUNDER SPEEDWAY CHAMPIONSHIP AWARDS BANQUET is open to the public. While a majority of the attendees are racers who will be receiving awards, it is a great night for family members, sponsors and fans as well to spend the evening with the recipients and enjoy the pageantry as trophies will be awarded to drivers who finished in the Top-5 in the track point standings in each class that competed at MISSISSIPPI THUNDER SPEEDWAY throughout the 2015 season. In addition to the track point standings awards, point fund checks will also be given to the Top-10 in the USRA and WISSOTA classes. Tickets are $25 for adults while tickets for youngsters 12 years of age and under available for only $15. The Awards Ceremony, hosted by MISSISSIPPI THUNDER SPEEDWAY announcers Dan Bailey and Dan Deicher will begin at 7:30 and will be followed by music and dancing via Rip-Roaring Entertainment! Door Prizes will also be awarded throughout the evening! 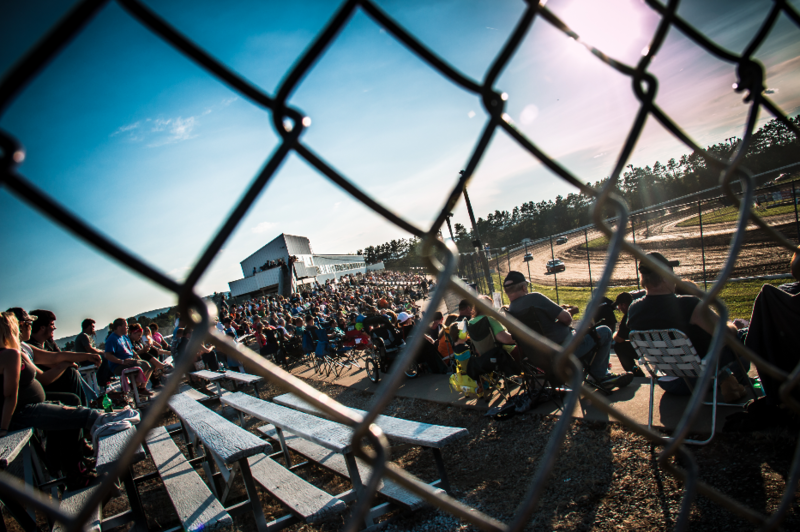 As they have for the past six seasons, racers and race fans alike flocked to MISSISSIPPI THUNDER SPEEDWAY Friday October 9th and Saturday October 10th to help wrap up the 2015 season by enjoying the season-ending Fall Festival presented by both Minnesota State Colleges - Southeast Technincal and EvovlHealth! While cool tempuratures had fans wrapped in blankets Friday night, blue sky on Friday and a near perfect conditions both Saturday and Saturday night combined with battles throughout the two-day special event definately off-set any lingering chills . 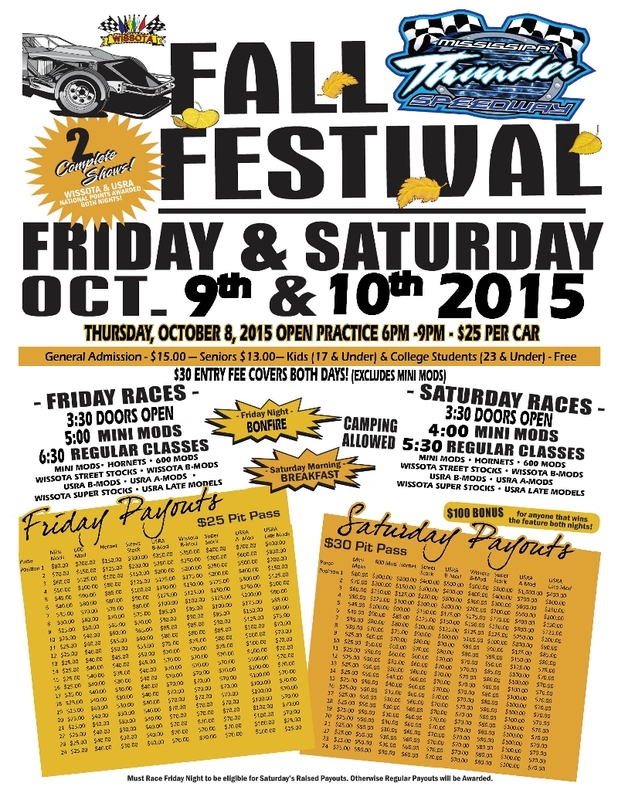 . .
MISSISSIPPI THUNDER SPEEDWAY INVITES YOU TO THE 7TH ANNUAL FALL FESTIVAL!! MISSISSIPPI THUNDER SPEEDWAY is excited to welcome you back to the area to wrap up the 2015 season with the special two-day extravaganza - The 7th Annual Fall Festival! 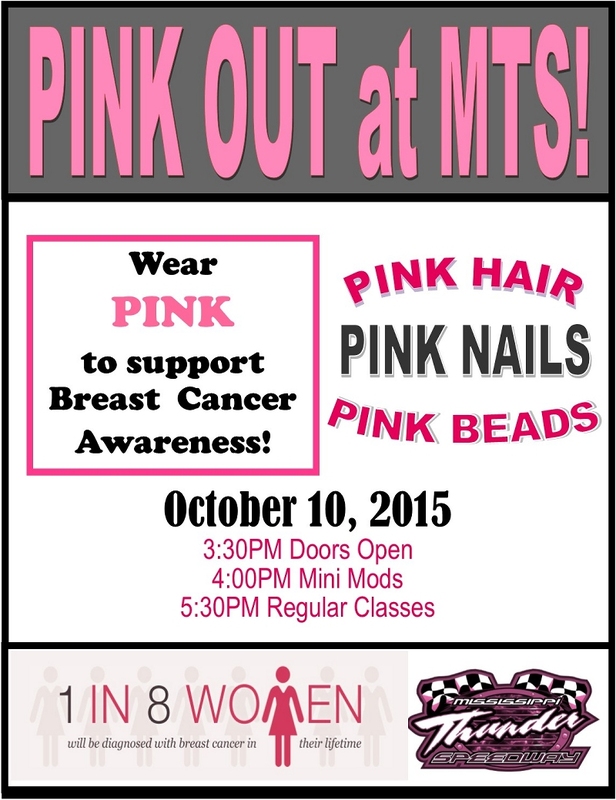 MISSISSIPPI THUNDER SPEEDWAY also invites all race fans to join us Saturday for our Fall Fest "PINK OUT"! When asked in Victory Lane if at the beginning of 2015 someone told him he'd be racing a B-Mod for $20,000-to-win, Ryan Gustin replied with a grin, "I'd race a moped for $20,000-to-win!" 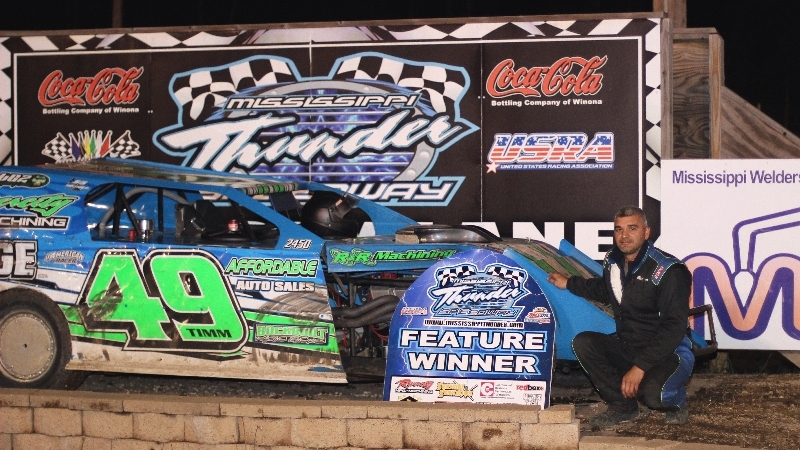 Saturday night, Gustin climbed behind the wheel of the #19 B-Mod and put a whooping on the 31-car field that had qualified for the "4TH ANNUAL DAHL CHEVROLET, BUICK, GMC $20,000-TO-WIN B-MOD NATIONALS, THE $130,000 WEEKEND" at MISSISSIPPI THUNDER SPEEDWAY - taking home the wad of cash and a trophy taller than he is! 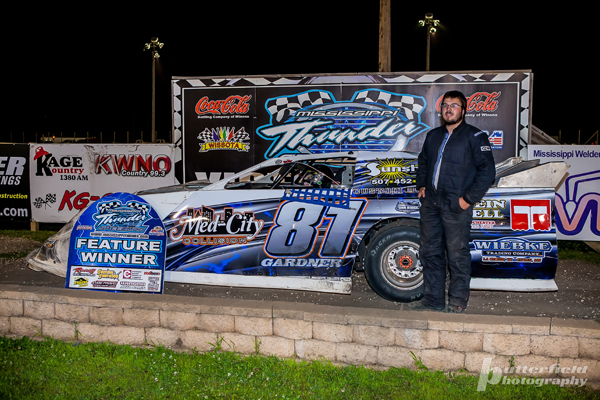 After Thursday qualifier feature win, all at the track realized that Gustin was going to be a force with which to be reckoned; Saturday's performance cemented the fact to all in attendance. After seven last-change qualifier "B-Mains" filled out the remaining positions of the 31-car field for the 60-lap $20,000-To-Win Main, Gustin took the green flag from the pole position - inside of the 3-wide front row and never once looked back . 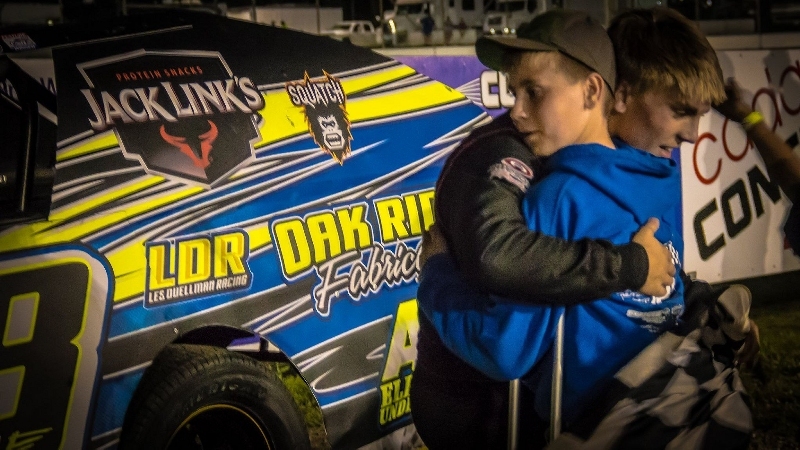 . .
SECOND EIGHT QUALIFIED FOR SATURDAY'S "4TH ANNUAL DAHL CHEVROLET, BUICK, GMC $20,000-TO-WIN B-MOD NATIONALS, THE $130,000 WEEKEND"
What a roller coaster ride of emotions for Grand Meadow, MN's Parker Hale. Over the last several day's this High School Senior and experienced the highest of highs and the lowest of lows - and handled them all with a maturity that is quite impressive for an individual of his age. Early this week, Hale and his family loaded up his #28 Jack Links Beef Sticks B-Mod and headed to MISSISSIPPI THUNDER SPEEDWAY the the most positive outlook posible; and why not? Just days earlier he's sewn up his very first Track Championship at one of the most competitive tracks in the Upper Midwest while competiting in hands-down one of the most competetive divisions - the Black Horse Bar & Grill USRA B-Mod Division; a divisions which AVERAGES anywhere from 28-30 cars per night at the 1/3-mile oval in Fountain City, WI. 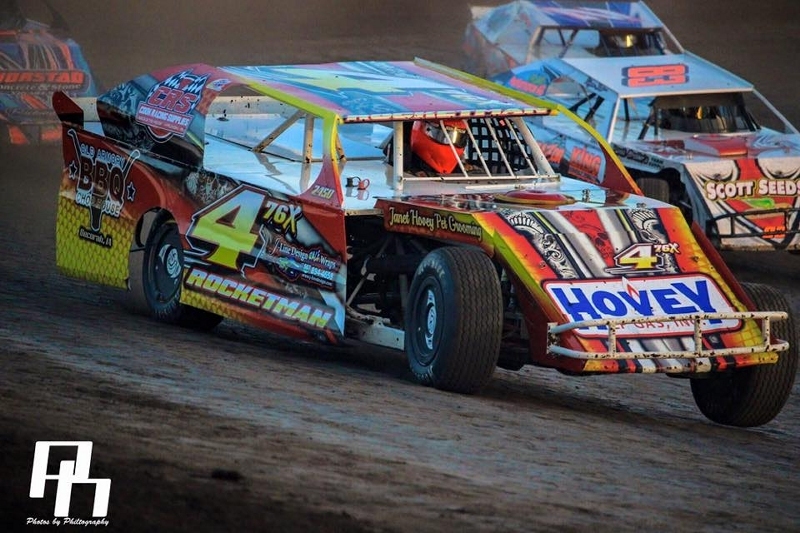 But their positive outlook was severely tested Thursday evening during the first night of the "4TH ANNUAL DAHL CHEVROLET, BUICK, GMC $20,000-TO-WIN B-MOD NATIONALS, THE $130,000 WEEKEND" when, during his heat race, a rear-end mount broke sending his Dirt-Dueller hard into the outside wall in turn three. "I was at full speed," commented Hale during an interview on the radio program LIVE TRACK-SIDE, "When it broke it sent me up the banking and right into the wall; just destroyed the right side of the car. That was probably one of the hardest hits I've ever had." But, just as they always do, the Hale's rallied to the challenge, spent all night Thursday and all day Friday working on the car and when he took the green flag for his Friday heat race it was obvious that they'd fixed everything - as Hale rocketed away from the field winning the evening's seventh qualifying heat-race and then simply dominating the evening's feature to cement his place in the starting line-up for Saturday's 60-lap $20,000-To-Win feature! Joining Hale in direct transfer positions for Saturday's Main were: Jared Boumeester, Dan Wheeler, Zach VanderBeek, Chad Clancy, Brad Ratcliff, Jake Smith, & Cory Crapser. 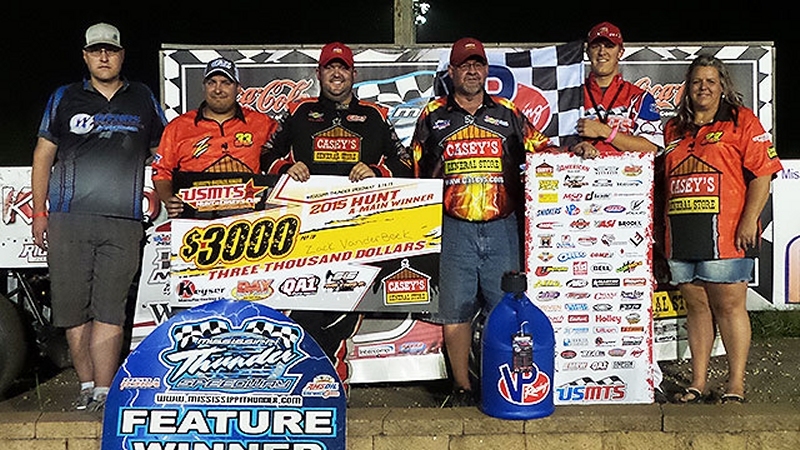 FIRST EIGHT QUALIFIED FOR SATURDAY'S "4TH ANNUAL DAHL CHEVROLET, BUICK, GMC $20,000-TO-WIN B-MOD NATIONALS, THE $130,000 WEEKEND"
On night number one of the "4TH ANNUAL DAHL CHEVROLET, BUICK, GMC $20,000-TO-WIN B-MOD NATIONALS, THE $130,000 WEEKEND" at MISSISSIPPI THUNDER SPEEDWAY it ended up being a classic battle of youth versus experience. 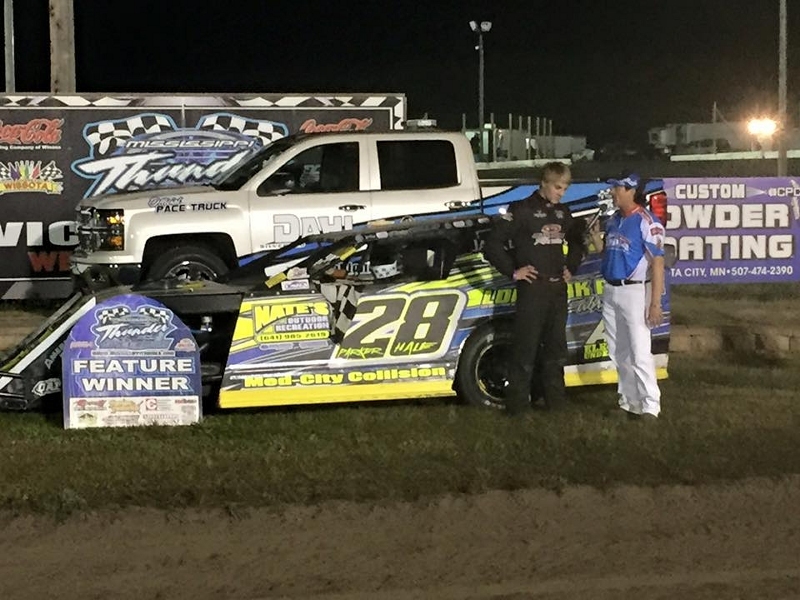 18 year old Jake Timm battled 2-time USMTS Champion Ryan Gustin at the front of the 30-car field of the first A-Main of the $130,000 Weekend. A win is great, but a front-of-the-field finish was paramount as the top-8 finishers of A-Mains Friday and Saturday enjoy an automatic seat in Saturday's $20,000-to-win main event. When the checkered flags waived, it was Gustin out front, but Timm in close pursuit! 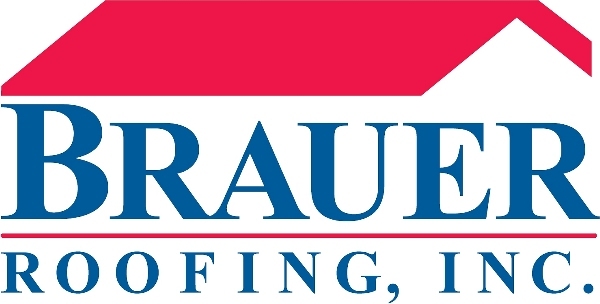 Joining Gustin and Timm in direct transfer positions for Saturday's Main were: Erik Kanz, Jacob Bleess, Ben Moudry, Shane Sabraski, Michael Truscott, and Nick Koehler. MISSISSIPPI THUNDER SPEEDWAY is pleased to welcome Dahl Chevrolet, Buick, GMC aboard as title sponsor of the "4TH ANNUAL DAHL CHEVROLET, BUICK, GMC $20,000-TO-WIN B-MOD NATIONALS, THE $130,000 WEEKEND"! In a unique, and almost ironic, synchronicity of timing - Dahl will be celebrating their Grand Opning at their brand new locaion 1201 W Hwy 61 in Winona Thursday September 10th with a related Special Grand Opening Sale to follow on Friday the 11th and Saturday the 12th. 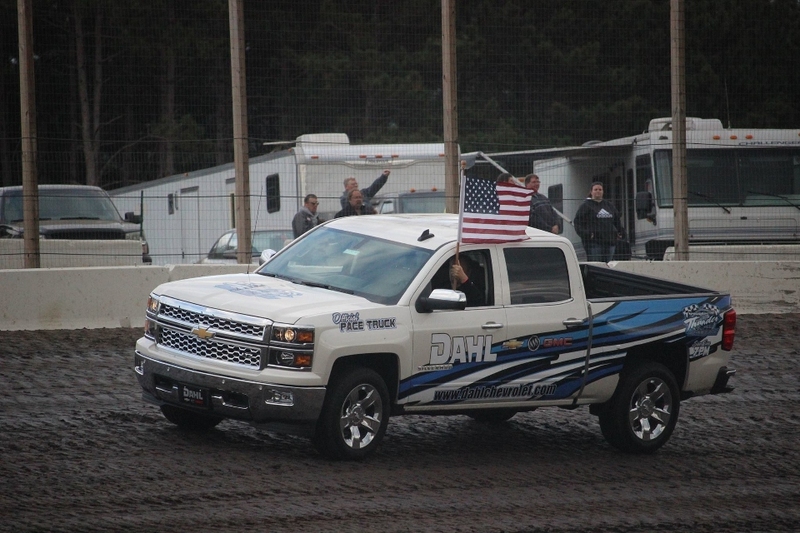 Dahl Cheverolet Buick GMC has been serving the South Eastern Minnesota and West Central Wisconsin areas for over 100 years, and as a Family-Owned business they share so much ideology with MISSISSIPPI THUNDER SPEEDWAY! As Dahl Chevrolet Buick GMC Sales & Leasing Consultant George McCarthy said during a recent interview, "both businesses are centered around the same thing - automobiles." 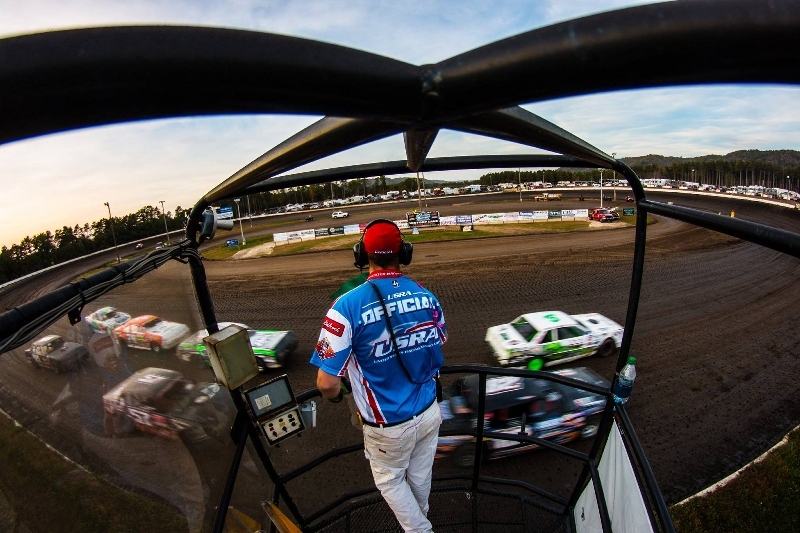 Just like MISSISSIPPI THUNDER SPEEDWAY, Dahl is a part of the local community; 5 Generations of the Dahl family have been serving their guests and the community since 1911. MISSISSIPPI THUNDER SPEEDWAY congratulates Dahl Chevrolet Buick GMC on the Grand Opening of their new location and their brand new spacious, state-of-the-art facilities. 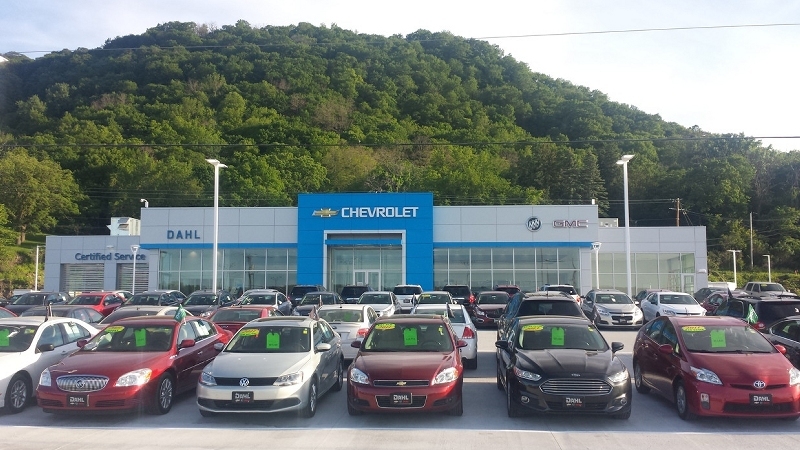 Feel free to visit their web site and get in touch with any member of their team to see how Dahl Chevrolet Buick GMC can help meet your automotive needs today! Fans turned out in big numbers for the 1st Annual Harmston Trucking Hornet Swarm during Loberg Auto Glass & Repair Night at MISSISSIPPI THUNDER SPEEDWAY. Almost 50 4-cylinder hornet competitors showed up for what was billed as a $700-to-win special event. But, by the time the final checkered flag had waived for the night, race fans in the stands had opened their own pocket books (or those of businesses which they represented) and almost $500 in additional money was added to the payout for finishing positions throughout the 30-car feature! As a matter of fact, feature winner Mark Bornitz took home $860 dollars, with many other finishers heading home with paychecks in the triple digits . . . .
MISSISSIPPI THUNDER SPEEDWAY is excited to welcome the excitement of 1st Annual Harmston Trucking Hornet Swarm to Loberg Auto Glass & Repair Night Friday August 21st! WES'S ENDLESS SUMMER- 2 RANDOM $25 GIFT CERT'S. LIQUID NITRO0 LAST 4 DRIVERS TO FINISH FEATURE GET 6 PACKS OF LIQUID NITRO. 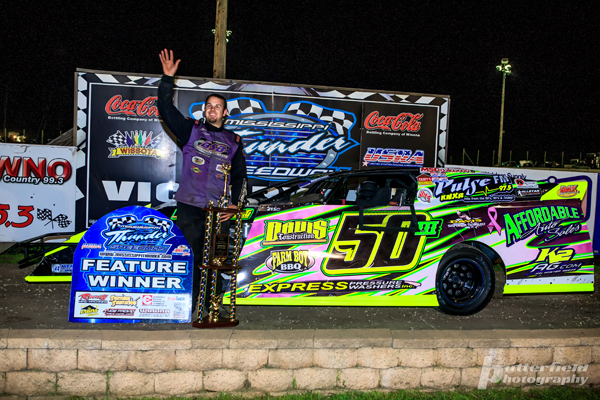 Just two days shy of the one-year anniversary of his last United States Modified Touring Series victory, Zack VanderBeek notched his first win of the 2015 campaign Friday night as the Hunt for the USMTS Casey’s Cup powered by S&S Fishing & Rental rolled into the Mississippi Thunder Speedway. The stars seemed to align early for VanderBeek when his nephew and crew member Nick Van Hemert drew the No. 33 pill on behalf of his uncle at the driver’s sign-in. That put VanderBeek’s No. 33z Casey’s General Stores LG2 by Owens on the pole for MSD Heat Race #1 which he won handily . . . . In the Hunt for the Casey’s Cup points battle, Stormy Scott is tied with Jason Hughes for second with 406 points while Sobbing is fourth with 398 markers. Dereck Ramirez (388), VanderBeek (376), Junghans (351), Johnny Scott (339), Dillard (337) and Jake Gallardo (324) fill out the top ten. 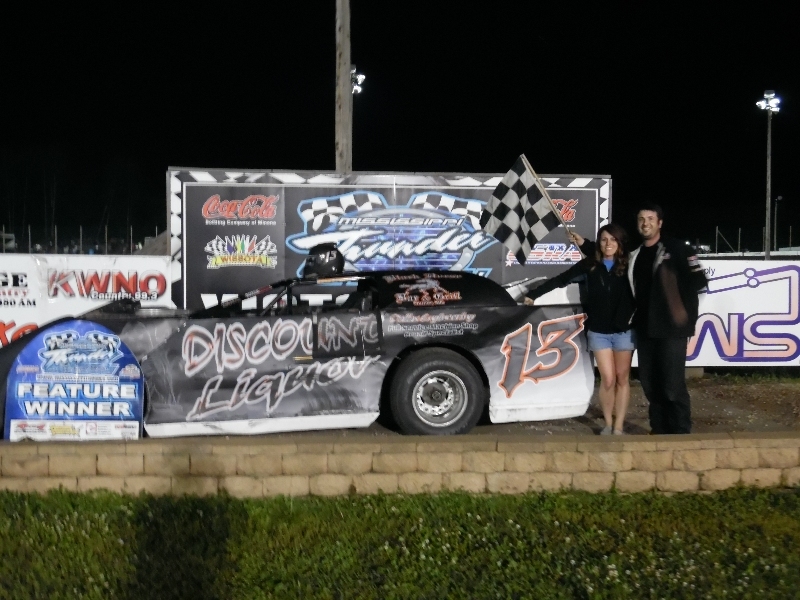 Friday's Winona Diesel / Peterbilt night at MISSISSIPPI THUNDER SPEEDWAY was the first of the final four regular season points paying events in the 2015 season; with the month of August completing the regular season before two big special events in September and October. But, for several drivers . 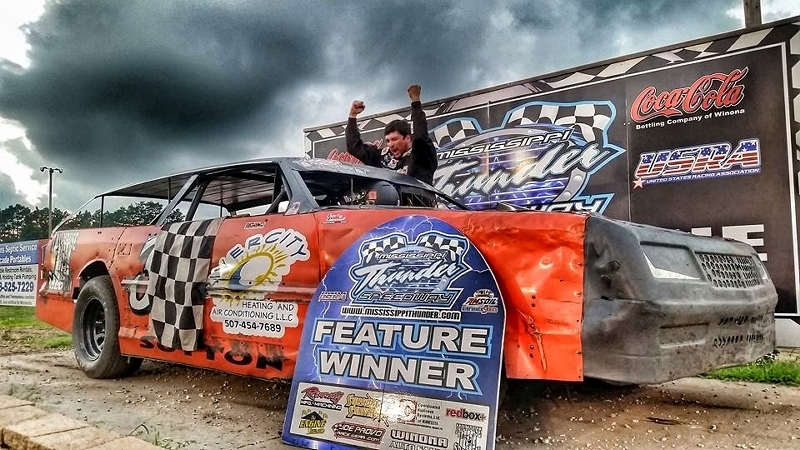 . . it was almost business as usual - as feature wins on "The Big 1/3-Mile" were collected by drivers who had all already enjoyed trips to Victory Lane this year . . . .
Parker Hale had ONE THOUSAND reasons to celebrate Friday evening after winning the 7th Annual Baehman Law B-Mod Challenge at MISSISSIPPI THUNDER SPEEDWAY . 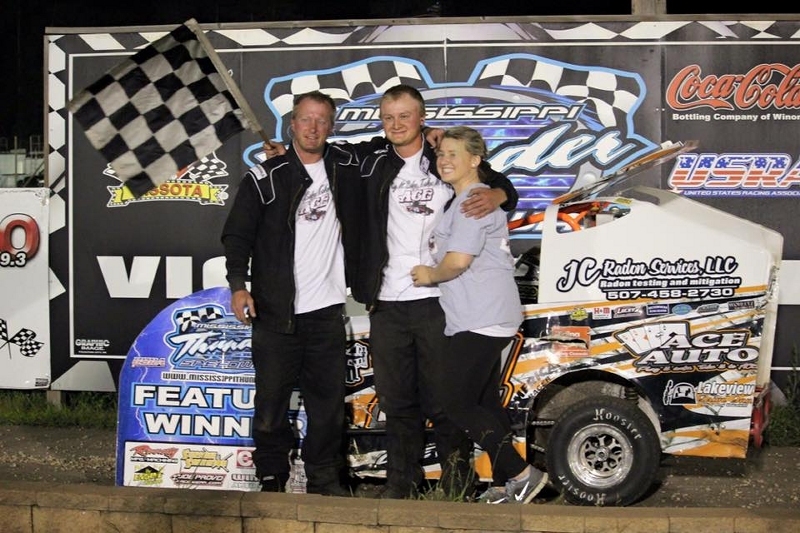 . . but his first thoughts upon climbing from his car in Victory Lane were his family as they joined him in Victory Lane . . . .
7TH ANNUAL BAEHMAN LAW B-MOD CHALLENGE IS COMING TO MISSISSIPPI THUNDER SPEEDWAY!! 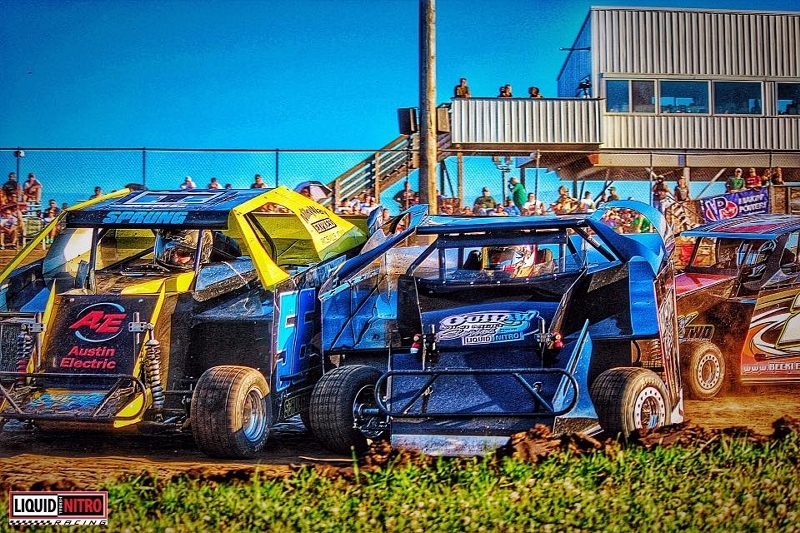 MISSISSIPPI THUNDER SPEEDWAY is excited to once again present the Baehman Law B-Mod Challenge! 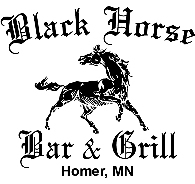 Friday July 31st, the Black Horse Bar & Grill USRA B-Mod racers will be battling for a $1000-to-win payday! 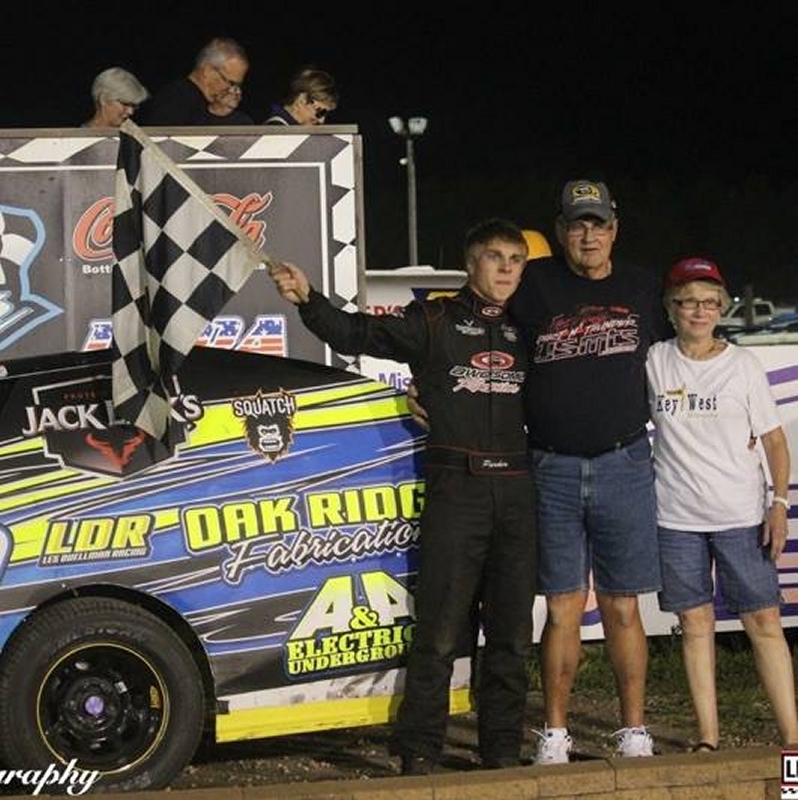 For the seventh year in a row, Baehman Law is ready to celebrate the USRA B-Mod division by hosting the $1000 to win Baehman Law B-Mod Challenge at MISSISSIPPI THUNDER SPEEDWAY. And if all of this is not enough, MTS Owner Bob Timm will be announcing a little surprise for everyone in the Pits! Joining in the excitement will be all regular weekly divisions: USRA Ltd Late Models presented by Liquid Nitro Energy Drink and Steve Yaggy Trucking, River City Manufacturing USRA Modifieds, Coordinated Business Systems WISSOTA Super Stocks, redbox+ 600 Mods, Jailhouse Saloon Sportsman, & MTS Hornets attacking the wide and sweeping corners of 'The Big 1/3-Mile'; while the Sunshine Refuse A & B Mini-Mods will again compete on THE LIGHTNING SPEEDWAY! The cliche is that "Nice Guys Finish Last" . 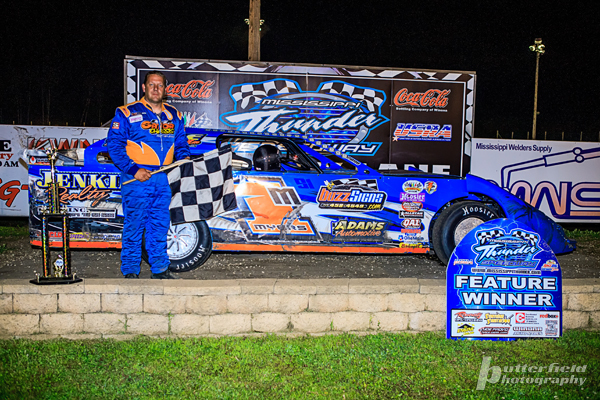 . . Casey Knutson brought the crowd in the grandstands to their feet Friday evening during Fastenal Night at MISSISSIPPI THUNDER SPEEDWAY as he waltzed into Victory Lane for his very first visit ever . . . and proved that cliche wrong . . . . 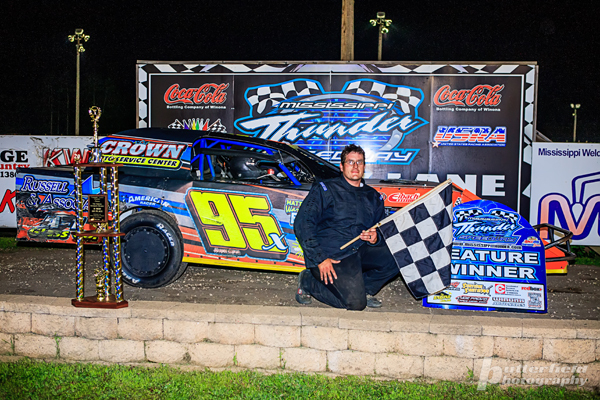 The action was hot, the winners were set on repeat mode and fans experienced just about every emotion possible friday night during Winona County Night at MISSISSIPPI THUNDER SPEEDWAY Friday July 17th . . . .
MISSISSIPPI THUNDER SPEEDWAY is excited to welcome the Batwing Chassis OUTLAW MINI MODS back to THE LIGHTNING SPEEDWAY for their first visit in 2015. After an unfortunate rain out cancelled the first scheduled visit ot the Outlaw Minis to MTS earlier this year . . . the Batwing Chassis racers are ready to bring their own unique version of pint-sized speed back to the area . . .
"Dog Days Of Summer"? 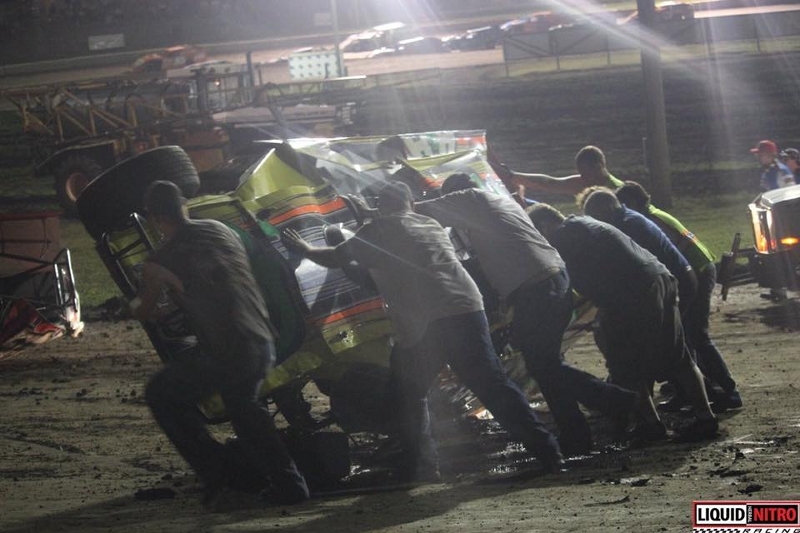 To some, that may be what it felt like during SugarLoaf Ford Night at MISSISSIPPI THUNDER SPEEDWAY Friday July 10th . . . hot and humid weather swept into the area, pressing down on the racers and fans with an almost palpable presence that never left the corner of a person's thoughts. But there were several individuals who enjoyed such sweet success that the celebrations easily allowed them the ability to forget about the thick conditions and smile. Cody Gardner was one of those individuals . . . .
For the seventh year in a row, RiverCity Manufacturing took over MISSISSIPPI THUNDER SPEEDWAY, inviting racers and fans alike to start their extended Fourth of July weekend celebrations with a night of fun and action at the 1/3-Mile dirt track in Fountain City, WI. For the seventh year in a row, the fans showed up, the drivers showed up and everyone enjoyed a record setting night . . . . 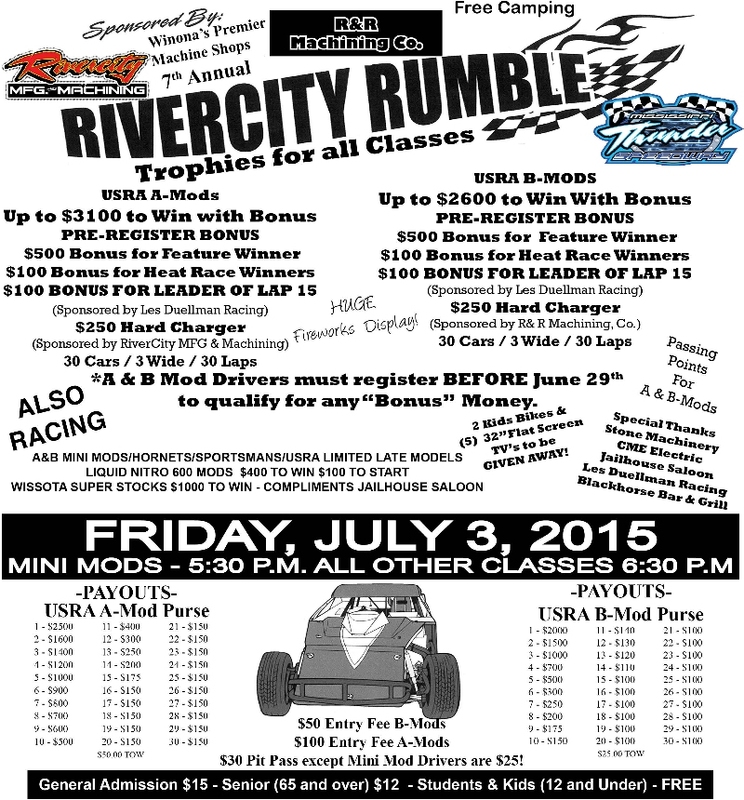 The SEVENTH ANNUAL River City Rumble is coming to MISSISSIPPI THUNDER SPEEDWAY Friday July 3rd. Keep your eyes on this web site for details as to who's pre-registered and what fun and exciting events and prizes are coming up . 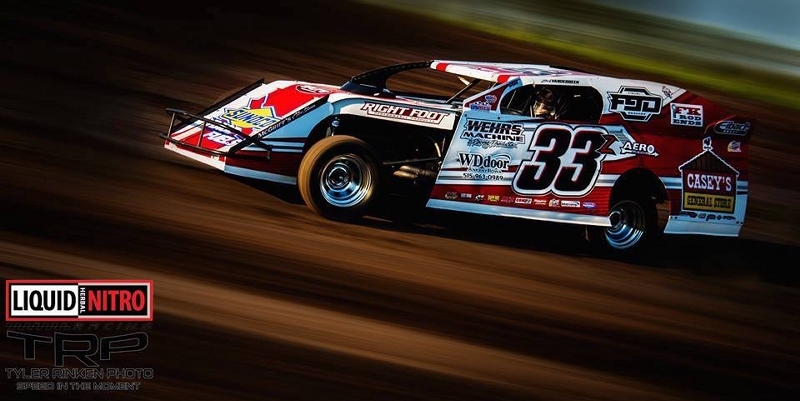 . .
Up to $3100 to win (with bonus $$) for the River City Manufacturing USRA A Mods and $2600 to win (with bonus $$) for the Black Horse Bar & Grill USRA B-Mods. 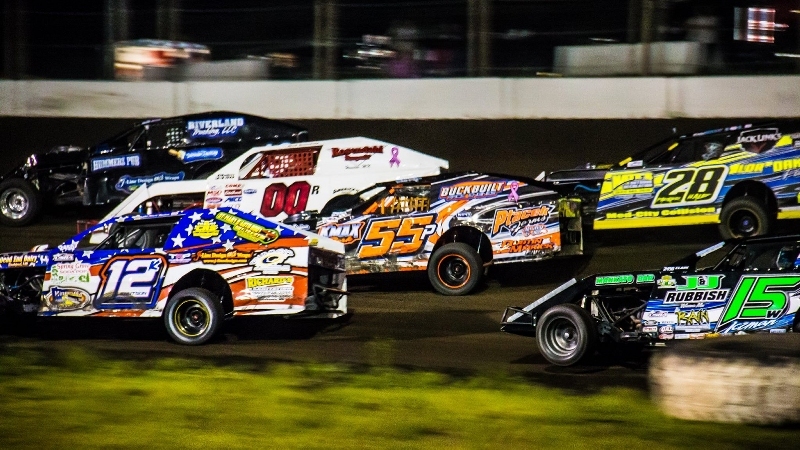 See both 30-lap USRA Modified features (A & B Mods) start 30 cars 3 Wide!! But drivers MUST Pre-Register by June 29th for A & B mod bonus money! Plus WISSOTA Super Stock drivers will be competing for $1000 to win! 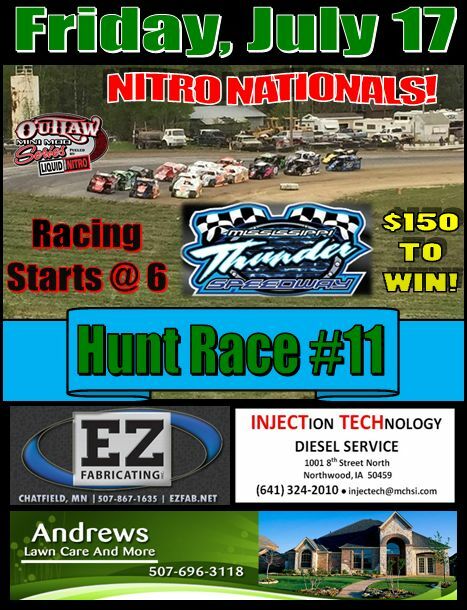 Liquid Nitro 600 Mods will be racing for $400 to win and guaranteed $100 to start! As NAPA AUTO PARTS of Winona, La Crosse & Rochester opened up the prize vaults for fans and racers alike, the sky turned a crystal clear NAPA Blue with bright sunshine blasting down on MISSISSIPPI THUNDER SPEEDWAY to create an absolutely picture perfect atmosphere for the racing faithful in West-Central Wisconsin, South-Eastern Minnesota & North-Eastern Iowa! 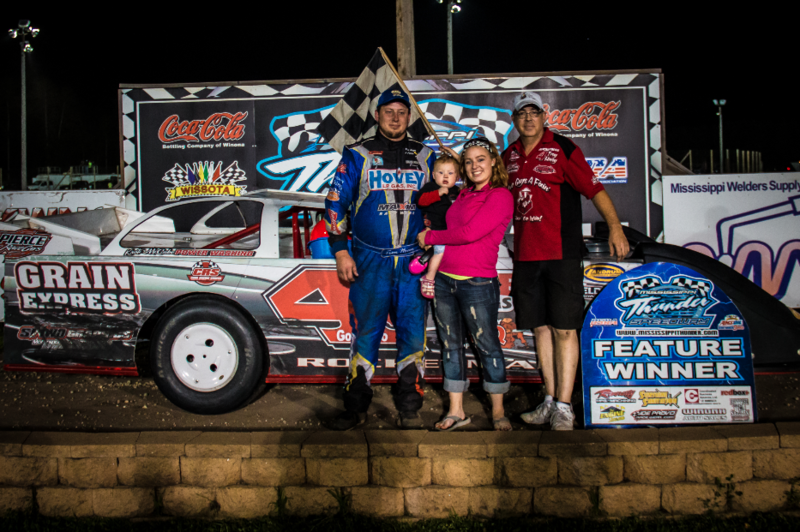 Former USRA B-Mod National Champion Troy Hovey picked this picture perfect night to enjoy his very first trip into the MISSISSIPPI THUNDER SPEEDWAY Victory Lane behind the wheel of his #4 USRA Ltd Late Model . . . .
One little change, that's often all it takes to make a difference; but Jon Van Minsel was beginning to think that no amount of changes would get his new Black Horse Bar & Grill USRA B-Mod into the MISSISSIPPI THUNDER SPEEDWAY Victory Lane . . . until the previous Friday, when a relatively minor alteration suddenly provided him with the drive-ability for which he'd been searching. That minor change rewarded him with a second place finish and much needed optimism after a slow start to the season. During pre-race interviews before Friday's Severson Oil night at MISSISSIPPI THUNDER SPEEDWAY he said, "Now all I have to do is improve that finishing position by just one more spot!" . . . . 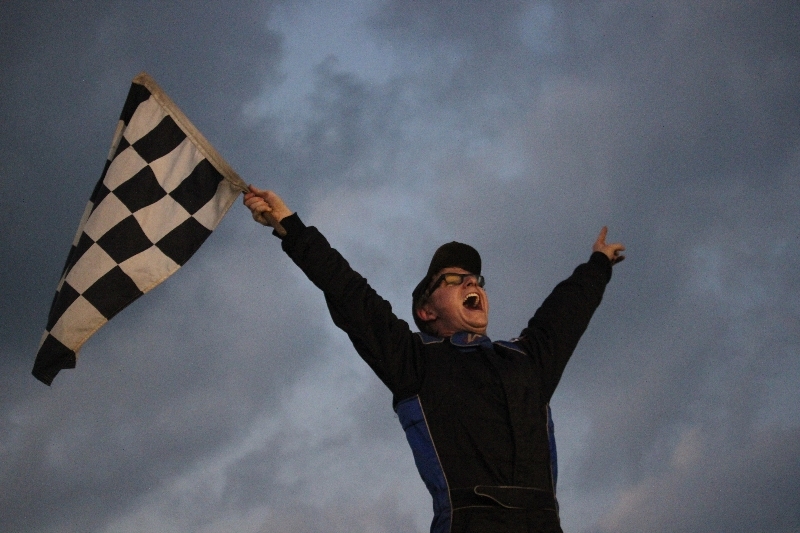 It isn't often that a two-time track champion celebrates in Victory Lane as if it were his very first feature win. It isn't often, any more, that fans see a feature-winning car in victory lane that looks exactly like one they may have used to make a trip to the grocery store. 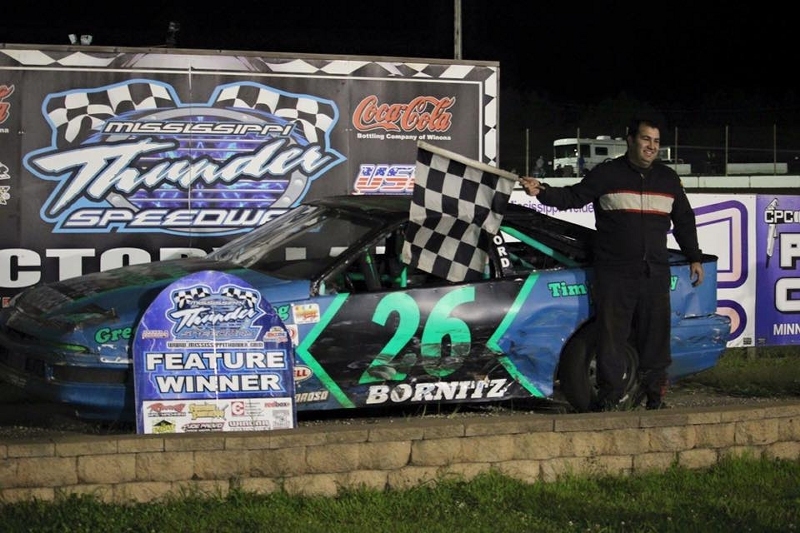 And it isn't often that fans get a chance to celebrate the 25th anniversary of an effort to support and promote short-track dirt stock car racing. 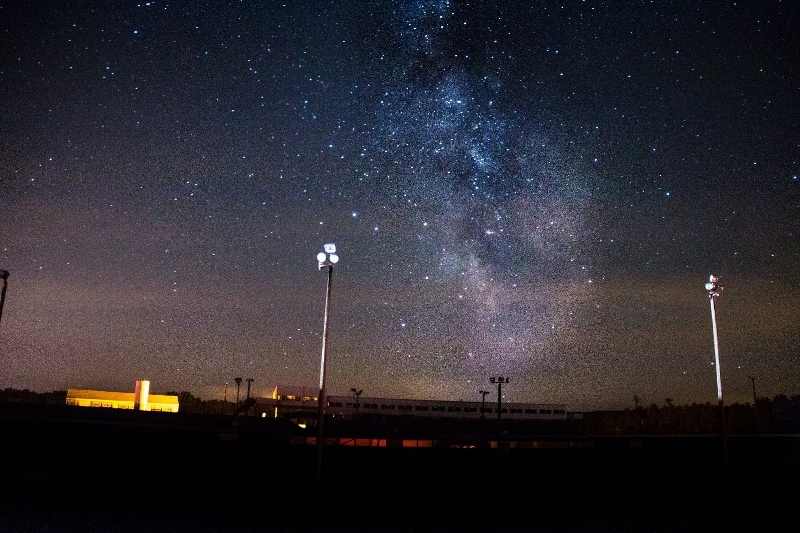 Friday night, June 5th . 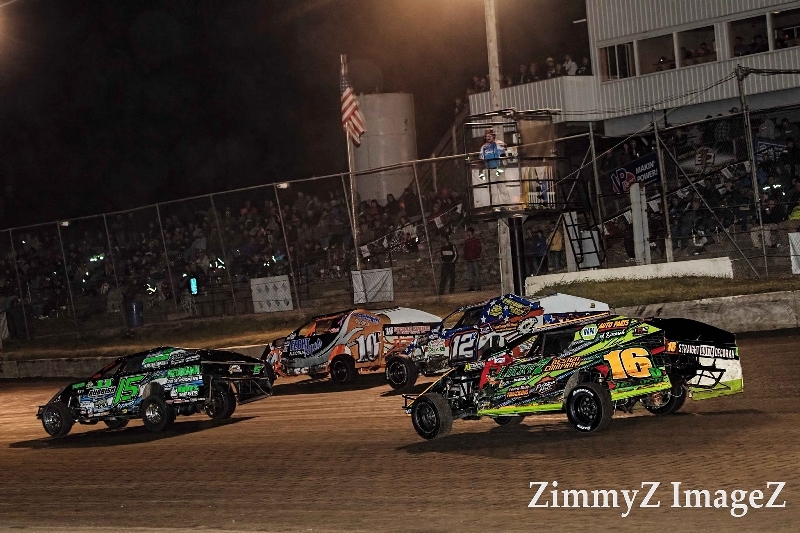 . . all of those scenarios played out during WINONA RADIO / BUD NIGHT at MISSISSIPPI THUNDER SPEEDWAY . . . .
On a beautiful start to the extended Memorial Day Weekend, racers and fans turned out in force to MISSISSIPPI THUNDER SPEEDWAY to begin festivities with a night of action and fun. After a touching opening ceremony, which included a moment of silence for those brave men and women who have made the ultimate sacrifice for our freedoms, it was down to business for the drivers strapped into their cars. 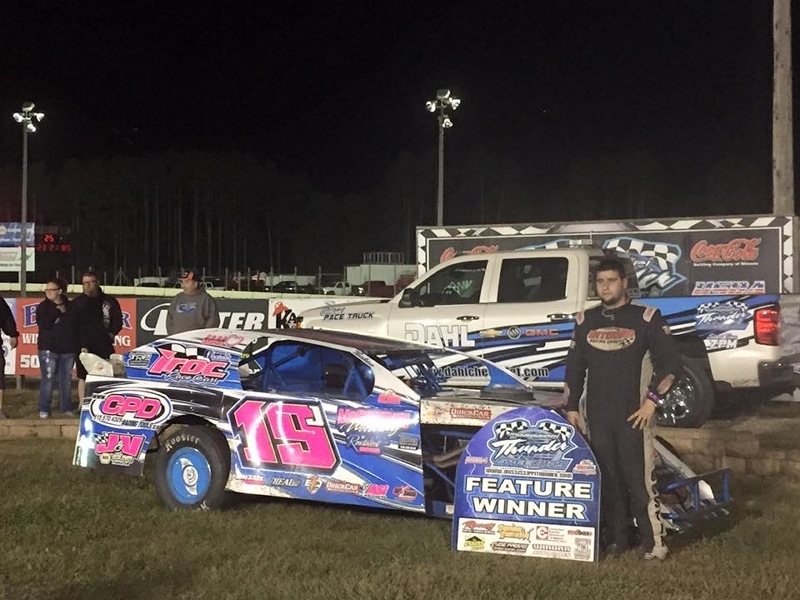 One driver who has been the subject of much talk, because of a strong start to his 2015 season, will be enjoying much more time in the lime-light after racing his way to his first feature win on 2015; Parker Hale took the momentum from three top-4 finishes in the opening three weeks of 2015 and used it to power him into the MISSISSIPPI THUNDER SPEEDWAY Victory Lane - winning the Black Horse Bar & Grill USRA B-Mod feature . . . .
After yet another week of rains the crew at MISSISSIPPI THUNDER SPEEDWAY did the unthinkable, whipping the wet and soggy 1/3-mile dirt track into yet another fast racing surface. And by all accounts from the reaction put forth by the racers who hit the surface, fast might actually be an understatement! Through an evening of twists and turns that had fans on their feet, drivers up on the wheel, and digital scoring software recording near fastest laps ever there was never a break in the action or surprises. 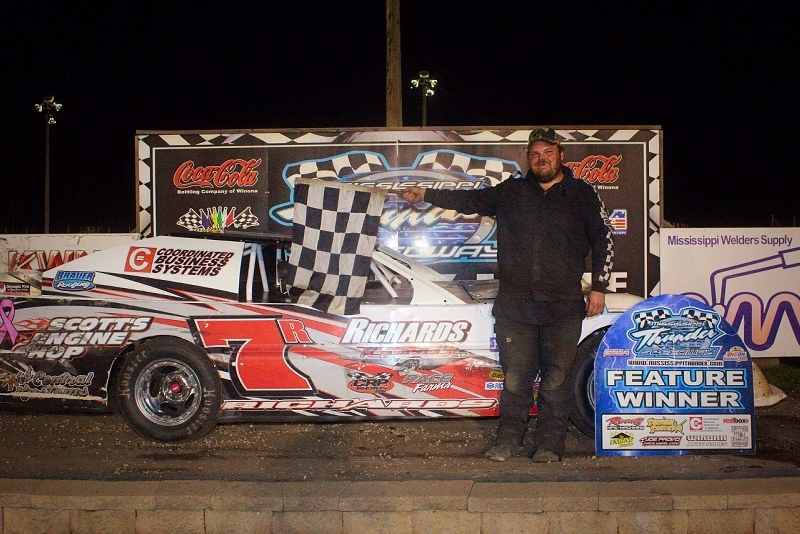 And after all was said and done, Three-Time and Defending Track Champion Tommy Richards had rolled his #7R back into the MTS Victory Lane . . .
After spending all day on the dirt track trying to whip MISSISSIPPI THUNDER SPEEDWAY into racable condition following a week of heavy rains, Bob Timm ended the evening sitting on an area of the facility which needed no grooming, no drying and no packing. 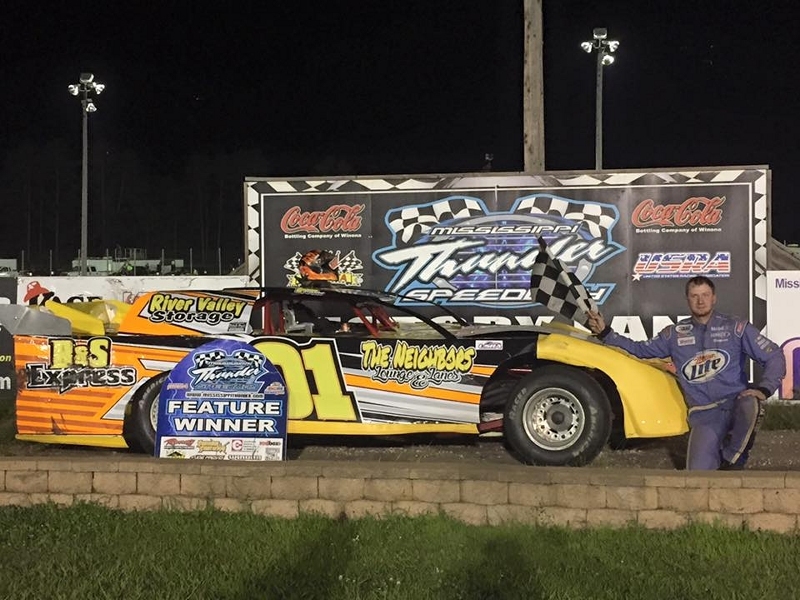 A 10 x 30 foot piece of concrete which could be rained on 24 hours straight and still support a race car; the MISSISSIPPI THUNDER SPEEDWAY Victory Lane! Rains through the entire week had many thinking that MISSISSIPPI THUNDER SPEEDWAY might not even see a green flag Friday evening May 8th, but Timm and his track crew got to work as soon as possible after the rains ended to insure that racers and fans alike could enjoy another night of dirt track action, "We've been working the track all day trying to get it into shape", smiled Timm in Victory Lane, "honestly, there was a short time earlier today when we weren't even sure if we'd be racing tonight. But with the great crew we have here, and a whole lot of equipment, we worked all day to get the track ready for racing tonight . . . The sights, the sounds, the excitment, the anticipation . 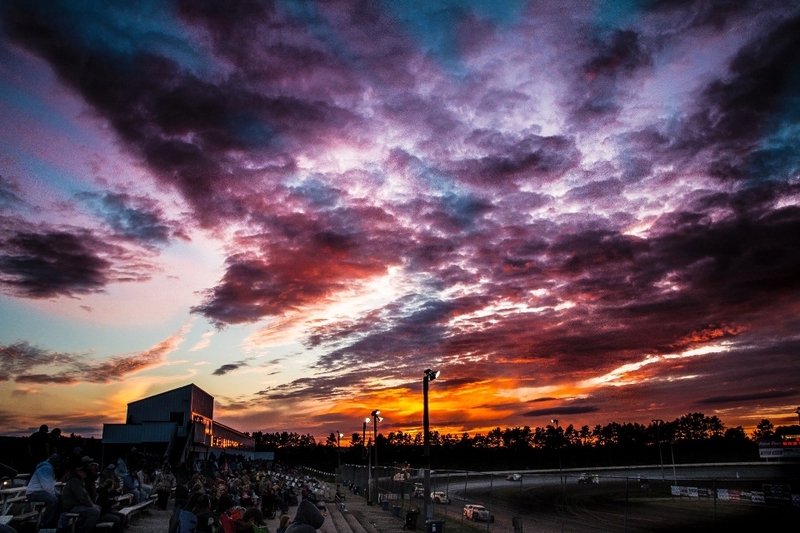 . . "Opening Night 2015" at MISSISSIPPI THUNDER SPEEDWAY in Fountain City, WI had all of that and more as racers and fans alike ignored cloudy skies and rains in the surrounding area and headed to the track to enjoy the one-week delayed start of the 2015 racing season! Much of the pre-race talk centered around the many changes offered for the new season as MISSISSIPPI THUNDER SPEEDWAY embarks upon it's seventh season of racing; two all-new weekly divisions, The Jailhouse Saloon MTS Sportsman & The All New USRA Limited Late Models Presented by Liquid Nitro Energy Drinks and Steve Yaggy Trucking along with the weekly return of the 4-Cylinder MTS Hornets joined the extremely popular Black Horse Bar & Grill USRA B-Mods, the fast Rivercity Manufacturing USRA Modifieds, the Coordinated Business Systems WISSOTA Super Stocks, and the lightning quick redbox+ 600 Mods to set the scene for an exciting first night of on-track action . 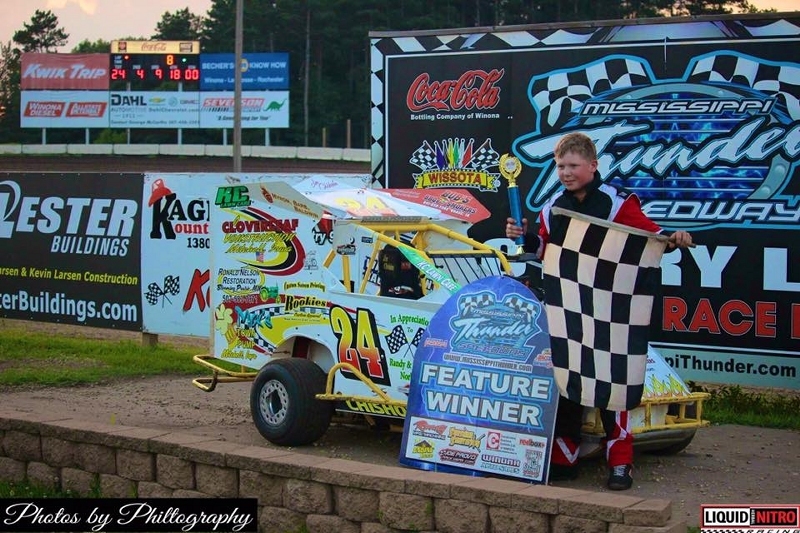 . .
MISSISSIPPI THUNDER SPEEDWAY is requesting assistance from all racers who plan on competing at MTS during the 2015 season. It would be extremely helpful if drivers could submit a 'Driver Profile/Registration' form BEFORE arriving for their first night of competition. 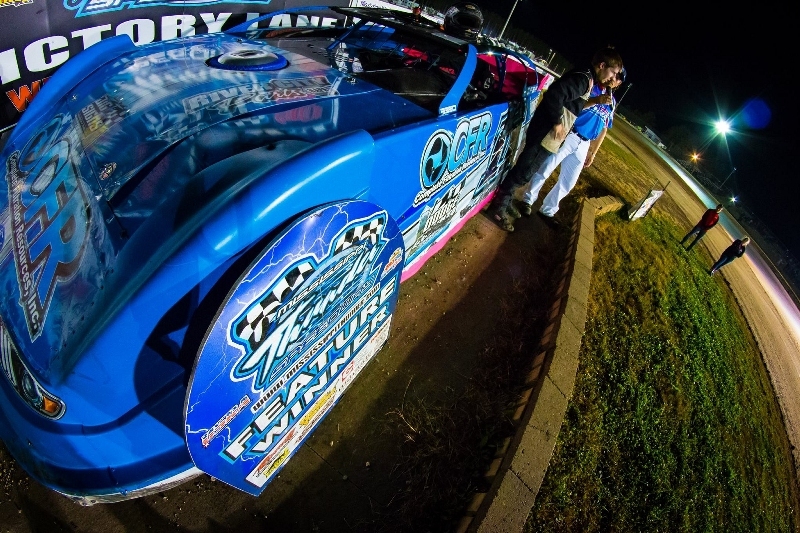 MISSISSIPPI THUNDER SPEEDWAY RELEASES 2015 DRIVER AUTOGRAPH SESSION SCHEDULE! MISSISSIPPI THUNDER SPEEDWAY has released an official schedule of Driver Autograph sessions! Race fans in the grandstands will be able to get autographs from drivers in specific divisions on certain evenings. Click on the following images to view a printable copy of the 2015 Autograph Session Schedule. 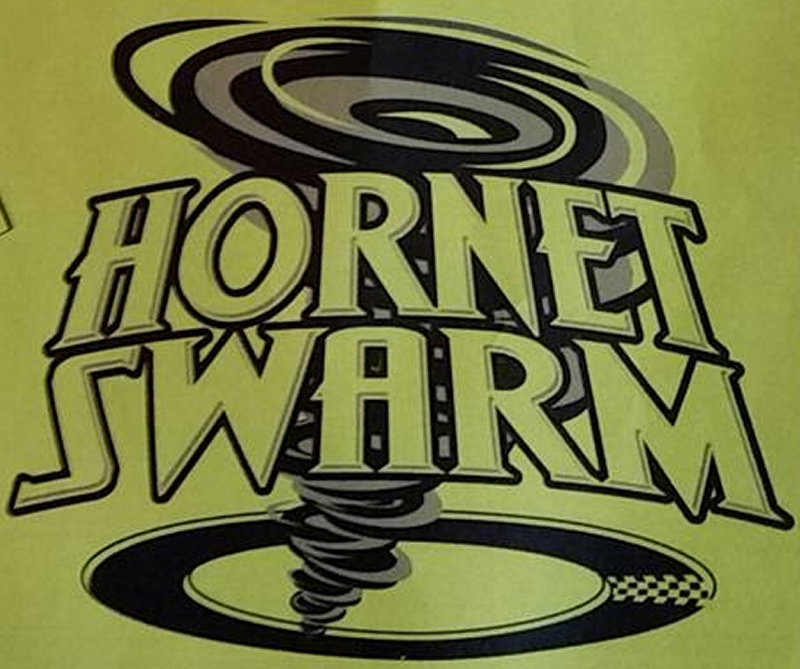 MISSISSIPPI THUNDER SPEEDWAY RELEASES 2015 HORNET RULES! MISSISSIPPI THUNDER SPEEDWAY has released the official rules for the Midwest Poker League Flyers Hornet Division, which is scheduled to compete at the high-speedway 1/3-mile for the entirety of the 2015 season! Competitors can find the Hornet rules on the MTS Driver Center page. 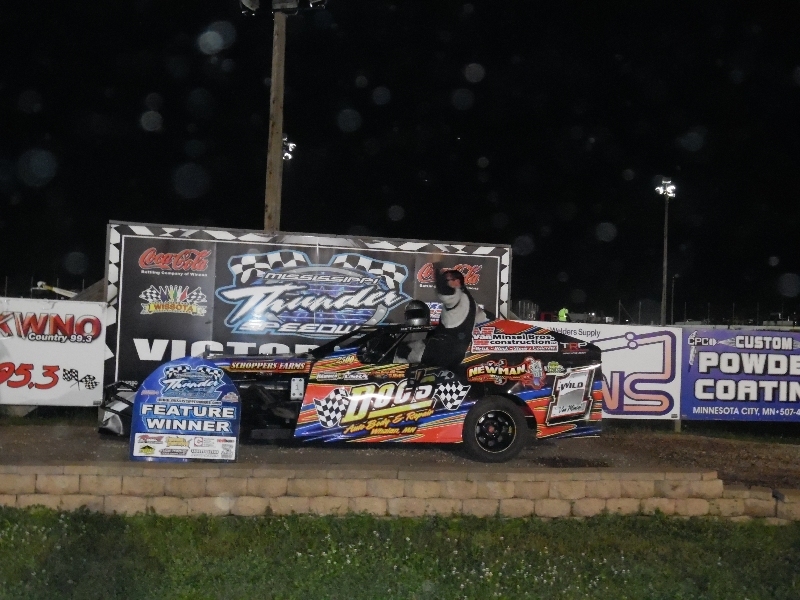 For the fourth year in a row competitors in the Coordinated Business Systems WISSOTA Super Stock division will have purse enhancements to look forward to in 2015. MISSISSIPPI THUNDER SPEEDWAY INTRODUCES THE ALL NEW "MTS KIDS CLUB"
MISSISSIPPI THUNDER SPEEDWAY is happy to introduce the ALL NEW "MTS KIDS CLUB"! Kids, do you love racing? 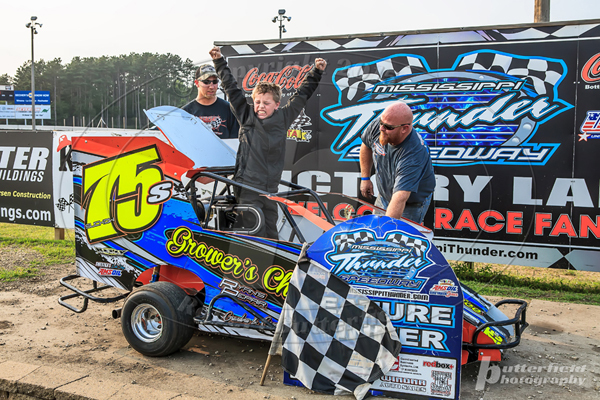 Do you want to be part of the fun specially designed for youngsters at MISSISSIPPI THUNDER SPEEDWAY? If so, then the "MTS KIDS CLUB" is for you! Young race fans (12 & under) now have the opportunity to interact with MISSISSIPPI THUNDER SPEEDWAY like never before with the ALL NEW "MTS KIDS CLUB"! And best of all . . . membership in the "MTS KIDS CLUB" is absolutely FREE for kids. 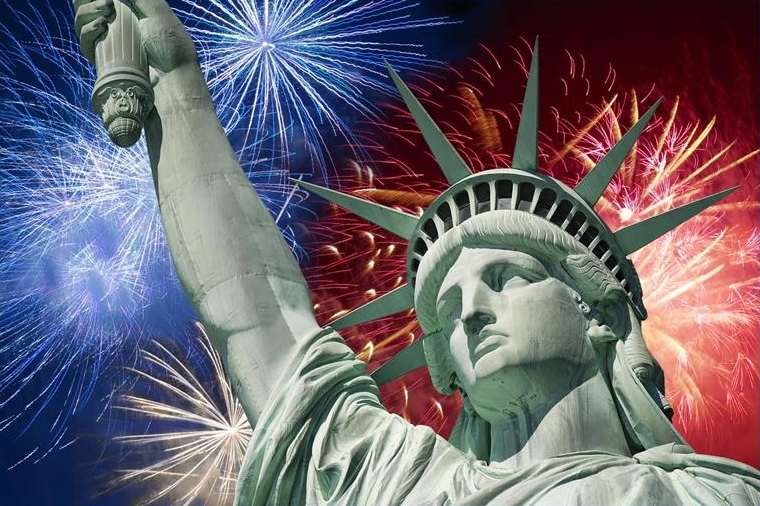 Unlimited access to all of the summer activities and events at MTS! Child's name will be entered into a drawing for Junior Announcer or Flag man for the night! And all you need to do to become an official member of the ALL NEW "MTS KIDS CLUB" is register. 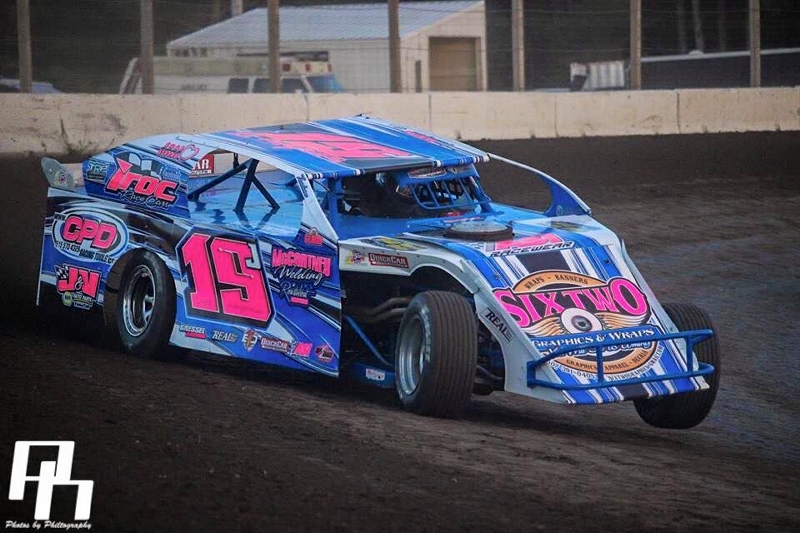 MISSISSIPPI THUNDER SPEEDWAY is excited to welcome STEVE YAGGY TRUCKING and LIQUID NITRO ENERGY DRINKS on board as 2015 title sponsors of the all new Limited Late Model division which will be hitting the fast, wide and racy "BIG 1/3-MILE" for the 2015 season! 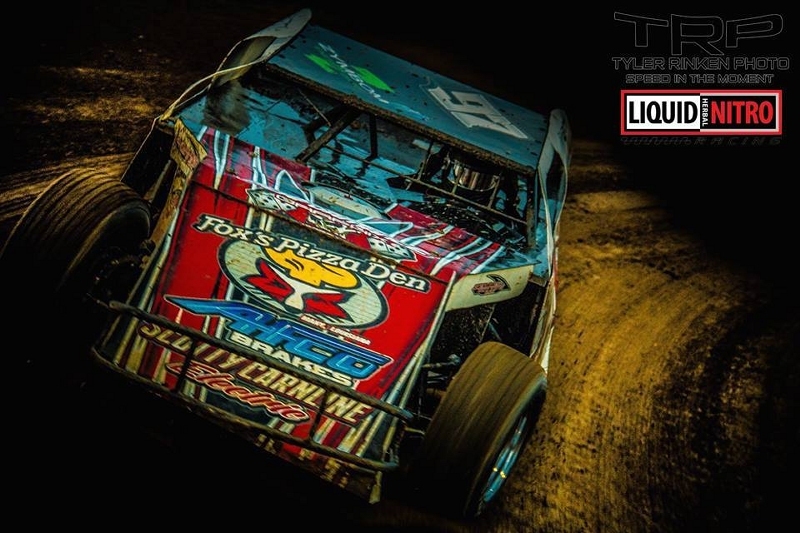 The involvement of these two title sponsors will help introduce "The All New USRA Limited Late Models, presented by Liquid Nitro Energy Drink and Steve Yaggy Trucking". 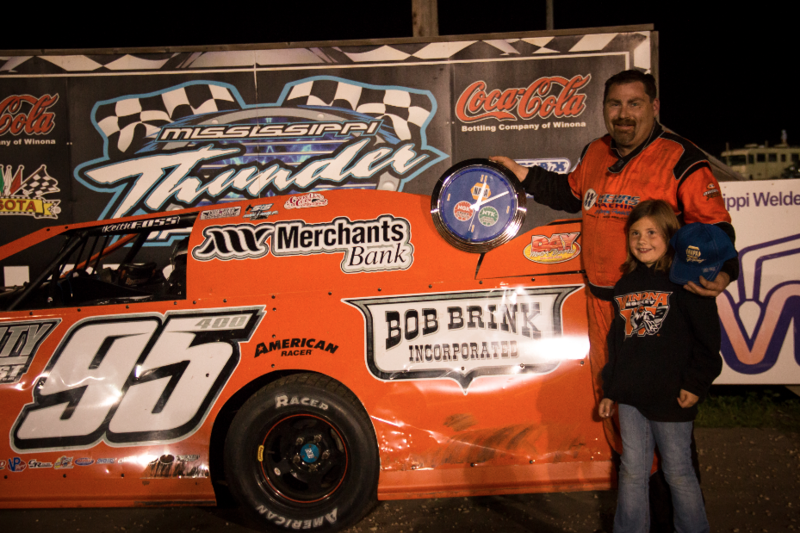 "MISSISSIPPI THUNDER SPEEDWAY has almost made it our normal operation to introduce new and exciting forms of racing to our fans and competitors", said MTS owner Bob Timm during the announcement, "We were instrumental in bringing the 600 mods to the upper Midwest, and we are very happy with the way that division has taken root and grown in the area. We truly feel that the same will happen with this all new USRA Limited Late Model division; a division which got its start in theory and planning right here at MISSISSIPPI THUNDER SPEEDWAY. "And while I have 100% faith in this new division, it's very important to the success of the division that we're able to draw a quality car count so that fans and racers alike can truly enjoy the division on our track," continued Timm, "to that end I'm extremely excited to announced and welcome the support of two quality businesses to this new endeavor . . . .
MISSISSIPPI THUNDER SPEEDWAY OWNER BOB TIMM NAMED "WINONA DAILY NEWS SPORTSPERSON OF THE YEAR"! "Multiple times in each of the past six years they have looked each other straight in the eye, looked in the mirror, then posed the point-blank question: Is this going to work? Will the race track that they have spent too many hours, too much labor, too much money, too much of their heart and soul, too much of nearly everything, pay off? After six racing seasons and nearly seven years of ownership, there is no simple answer, no black-and-white reasoning to steer them one way or the other. So they keep turning left. When you have a passion for something, as these four people — and their families — do, it is hard to let go, to even think of doing something else. 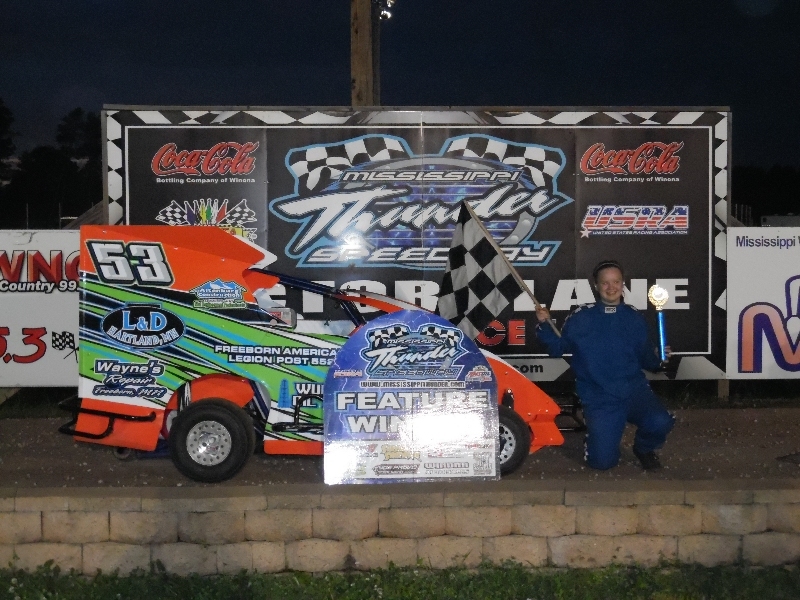 Bob and Paula Timm, along with Tom and Tina Lochner, knew they were in for an uphill climb when they formed an ownership group to purchase what was known as Tri-Oval Speedway in the fall of 2008, then began building what they named Mississippi Thunder Speedway. 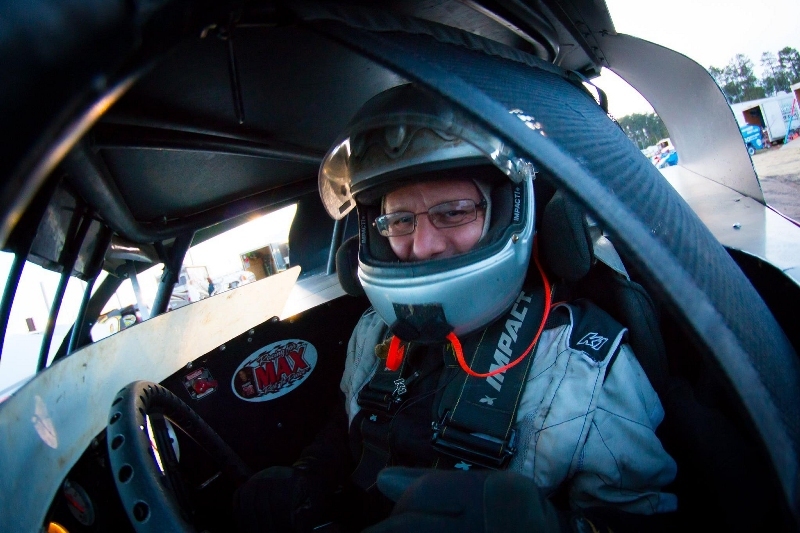 When the gates open for the seventh season on April 24, 46-year-old Bob Timm — who is the main “hands-on” man or manager of the fledgling dirt track near Fountain City — can smile. 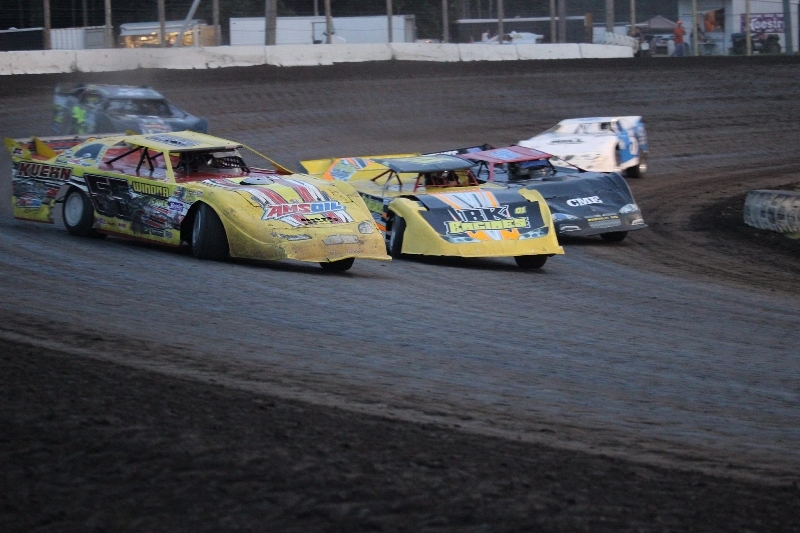 In a day and age when race tracks — dirt and asphalt — seem to be closing each week, Mississippi Thunder Speedway has beaten the odds. That is why Timm, a highly successful racer himself, has been named the Winona Daily News Sportsperson of the Year. 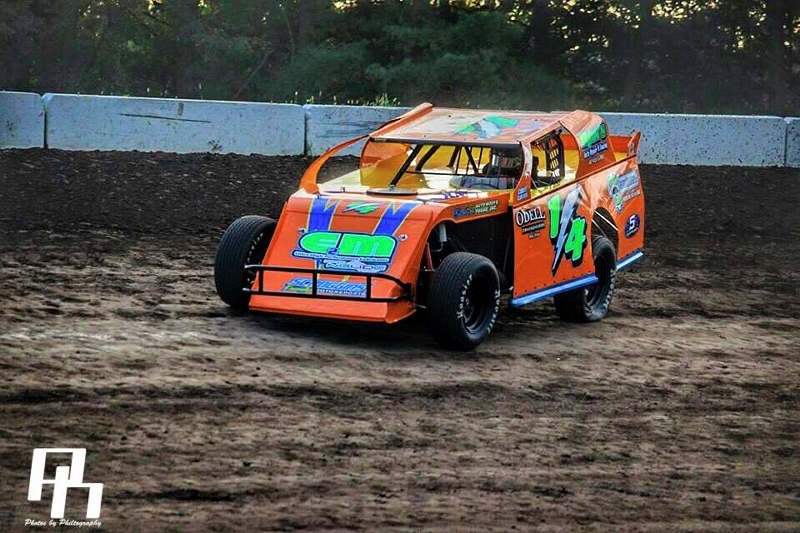 He has taken a dirt track, leveled it, rebuilt it, and turned it into one of the top dirt racing facilities in the state . . . ."
Read the ENTIRE ARTICLE at the Winona Daily News Website. 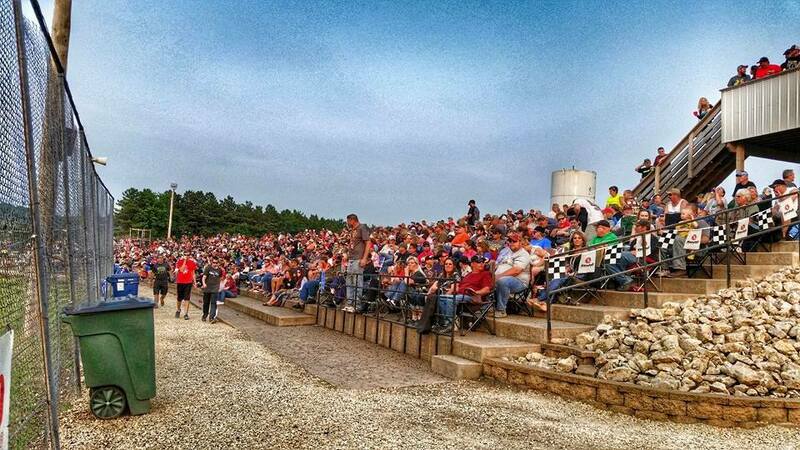 MISSISSIPPI THUNDER SPEEDWAY BEGINS RELEASING DETAILS FOR AN EXCITING 2015 SEASON! 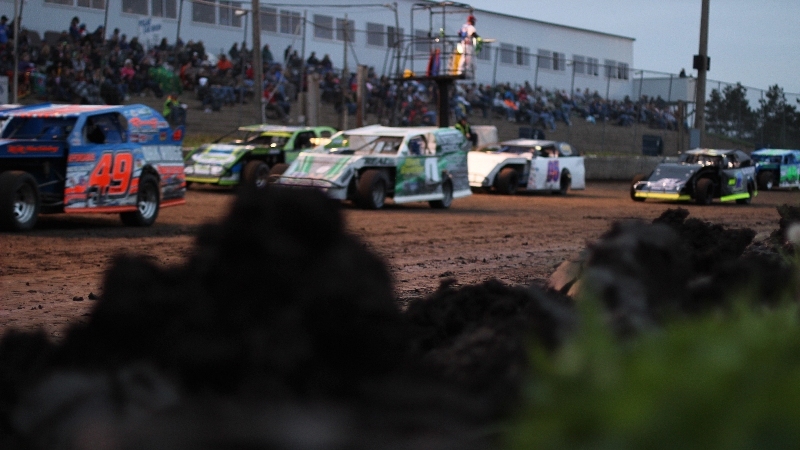 MISSISSIPPI THUNDER SPEEDWAY began the new year of 2015 by releasing initial details for what looks to be an amazing and exciting 7th year of action at the fast, wide and racy "BIG 1/3-MILE" situated just an echo away from the banks of the Mighty Mississippi River on the borders of West-Central Wisconsin! Pay scales have been released for all divisions scheduled to compete at MISSISSIPPI THUNDER SPEEDWAY. In addition to those pay scales, rules packages have been released for two divisions which will be making their maiden voyages on the high-banks of MTS! The first division related news is that after a reduced-schedule trial period in the 2014 season, MTS will welcome 4-Cylinder Hornets back to the track as a regular weekly division. 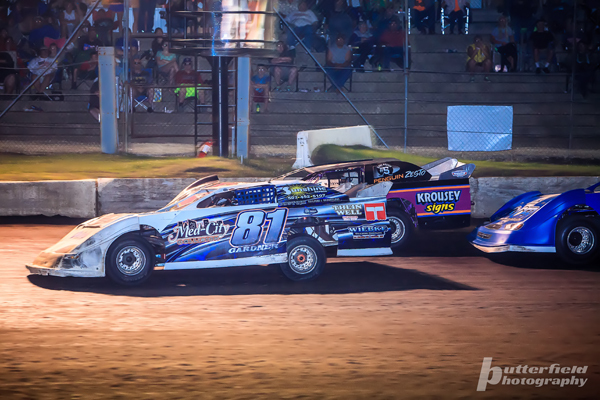 The 2014 series of "Midwest Poker League Flyers" proved to be exciting and fun for both racers and fans alike; "I was impressed by the racers enthusiasm and dedication to Mississippi Thunder Speedway last year", said Speedway owner Bob Timm, "The car counts were good, considering a limited schedule - and they really did put on a fun show. I think we're all excited to see what they can do through a full season in 2015." Another change for 2015 is a re-organization of classes and class structures for full-framed street bodied action. 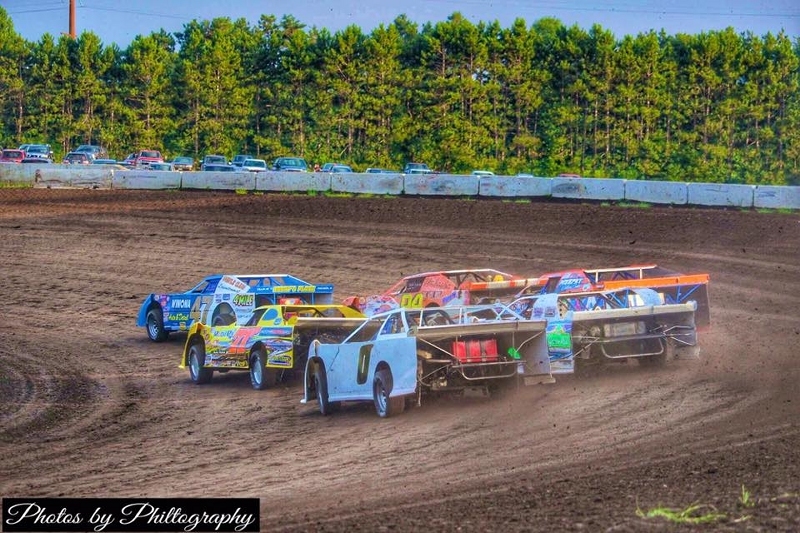 Gone are the WISSOTA Street Stocks and MTS Pure Stocks; replacing them will be an all new "Sportsman" class which takes the best aspects of both divisions and combines them to create a new division which should satisfy fans of dirt track racing based upon the usage of true 'street cars'. "Let's face it", said MTS race director Chris Abts, "there's nothing pure about pure stocks anymore. But, we think that the rules for this new 'Sportsman' class retain enough of that feel of real street cars hitting the sweeping turns at speed to keep the purists happy." 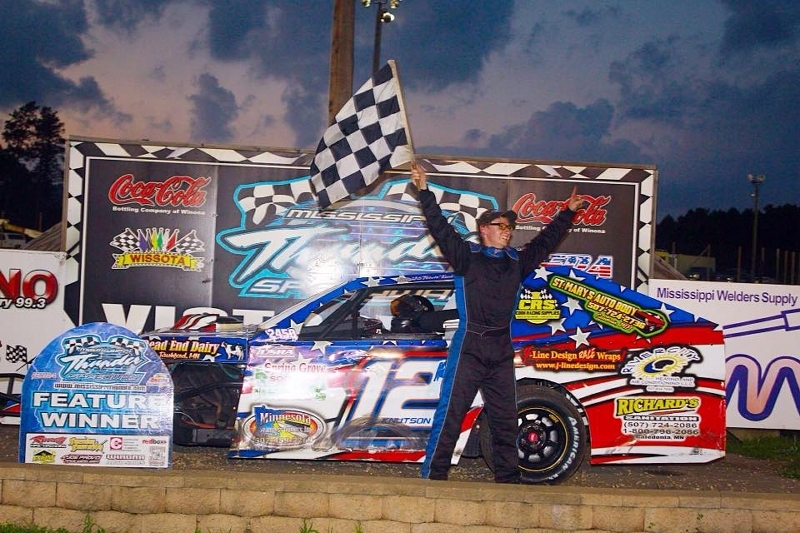 And the big announcement for 2015 is the creation of an all new "Limited Late Model" class which has been embraced not only by local and regional racers, but also by the USRA Sanctioning body! 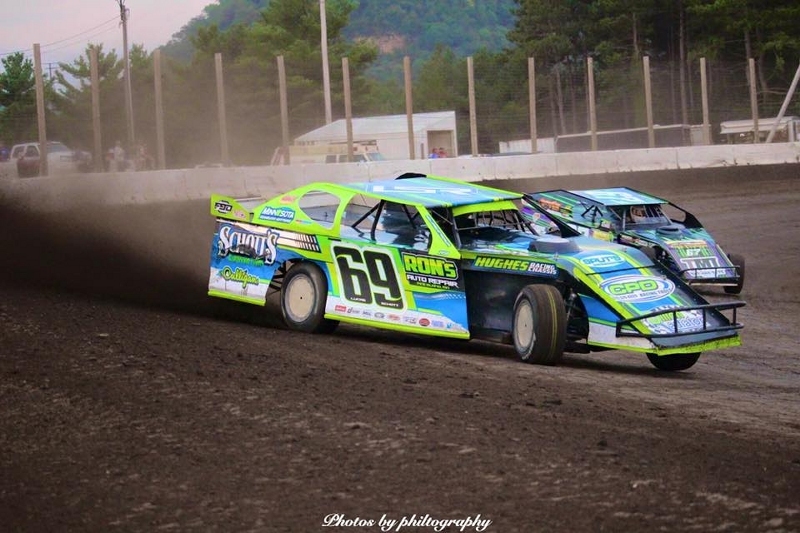 "The rules that we put together", commented Bob Timm, "are focused on true Late Model racing with prices which are much more realistic and approachable. The Late Model Class was simply becoming unaffordable for local racers and weekly tracks alike. We think we've put together something that can maybe save this form of racing for weekly tracks and fans. 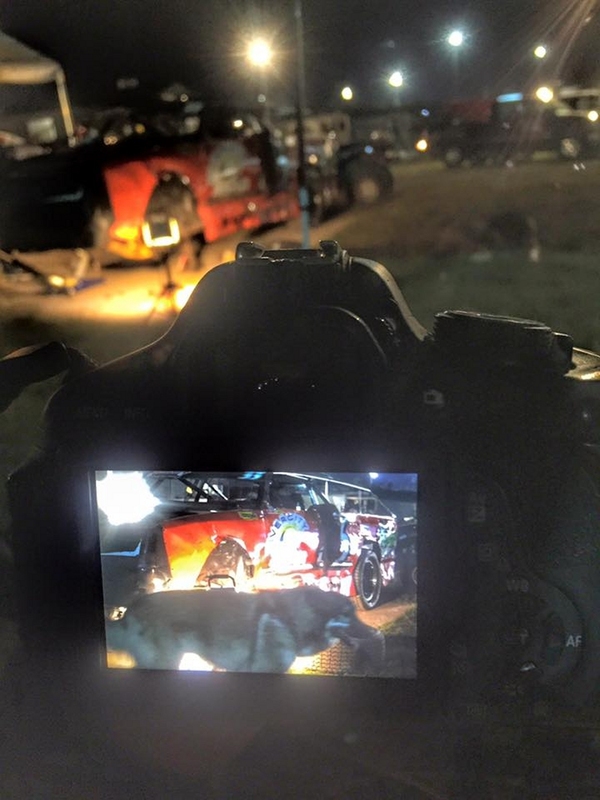 I honestly think both the fans and the racers will see this as a great alternative to NO LATE MODELS at all." 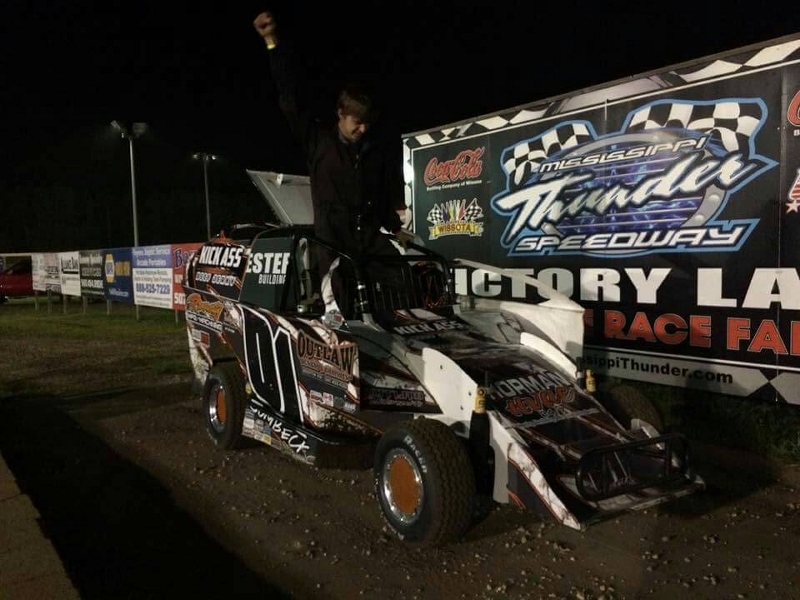 Timm's thoughts were echoed by a recent post to the MISSISSIPPI THUNDER SPEEDWAY Facebook page (visit HERE): "It is official! 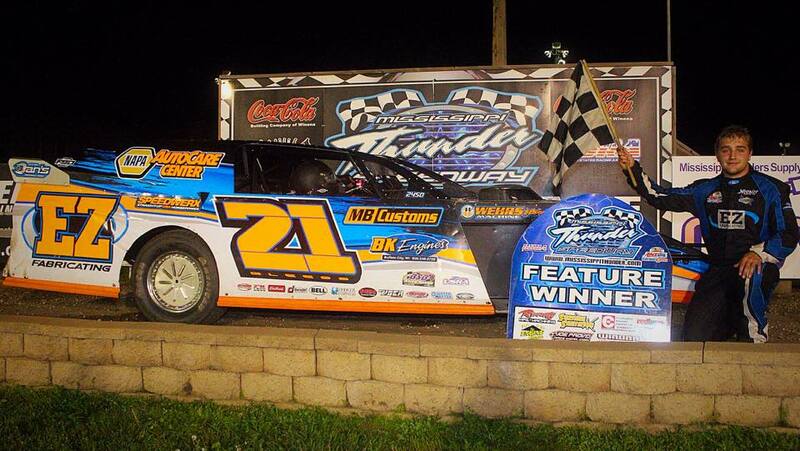 Limited Late Models will run at MTS in 2015 under USRA Sanctioning! 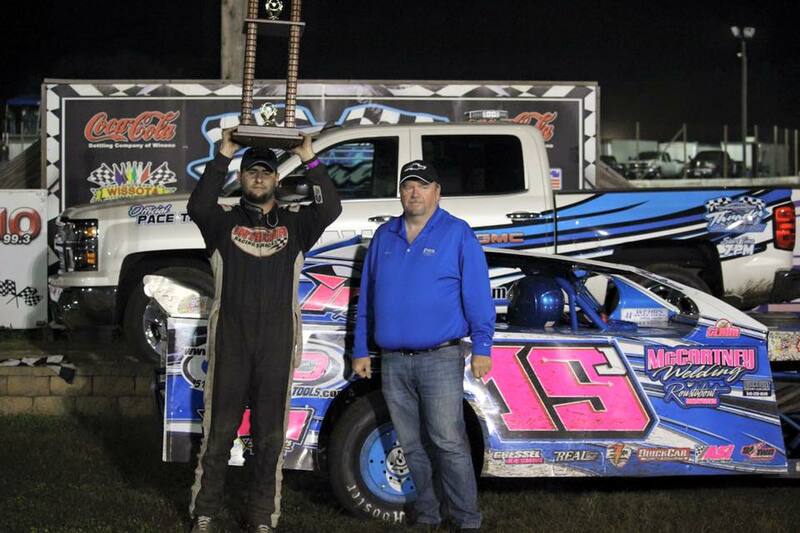 USRA will be paying a 2015 weekly track champion point fund and will be working to put together a national champion point fund for 2016! USRA will be announcing their decision to sanction the class soon! Rules are complete and a preliminary rules package will be posted shortly .... 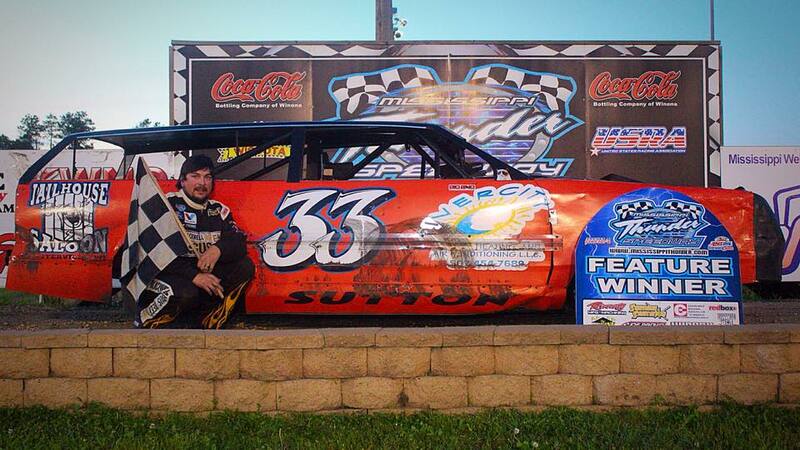 Very excited to see the revival of Late Model racing in our area!" In addition to pay scales and rules, a tentative 2015 season schedule has been put together which once again puts together all the ingredients necessary to make Friday Nights at MISSISSIPPI THUNDER SPEEDWAY the "Must Be There" destination for racers and race fans alike! 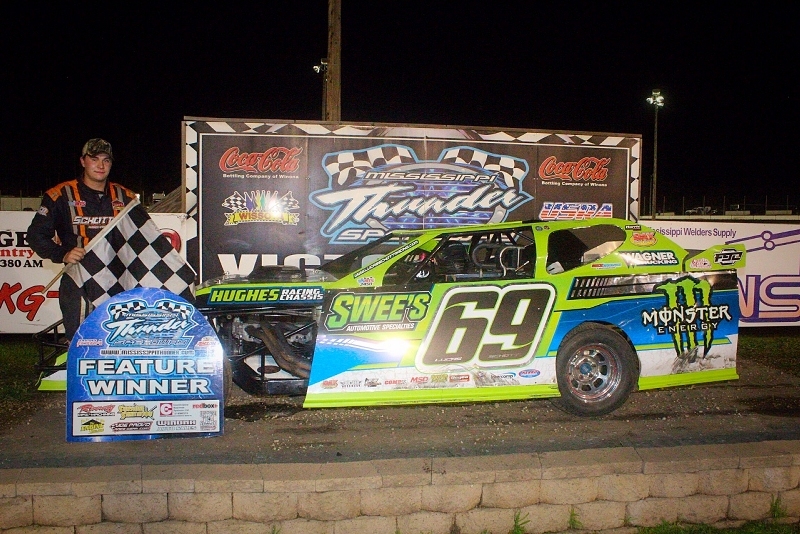 The tentative 2015 schedule gets the green flag compliments of an open invitation to both racers and fans with the 2015 car show and swap meet schedule for Saturday April 18th at Sugar Loaf Ford of Winona. 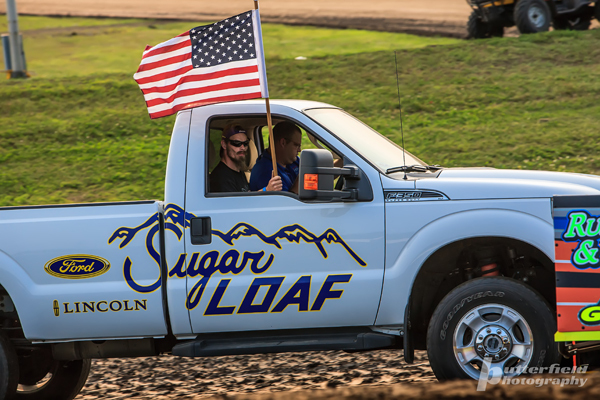 The newly renovated Sugar Loaf Ford Dealership allows racers and fans to enjoy a close look at all the new machinery from the clean indoor service area. Rules and Pay Scales have already been posted on the MTS web site and can be viewed on the "Driver Center" page. The tentative 2015 MISSISSIPPI THUNDER SPEEDWAY Schedule can be viewed on the web site's "Schedule" page. MISSISSIPPI THUNDER SPEEDWAY is truly excited to be looking forward to the 2015 season - and we hope you will join us for a EXCITING, FUN and FAMILY FRIENDLY FRIDAY NIGHTS!! !